1. Remove the screw using a Phillips-head screwdriver. The screw does not drop. Halogen bulbs get very hot when lit. Oil, perspiration, or a scratch on the glass can cause the bulb to overheat and shatter. The fog lights are halogen bulbs. When replacing a bulb, handle it by its plastic case, and protect the glass from contact with your skin or hard objects. If you touch the glass, clean it with denatured alcohol and a clean cloth. 2. Insert a flat-tip screwdriver into the tab at the inside edge of the cover, then pull straight out as indicated to remove the cover. 3. 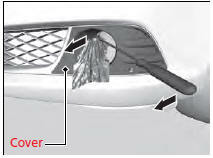 Remove the screws using a Phillips-head screwdriver and carefully pull the fog light assembly out of the bumper. 4. 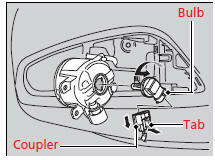 Push the tab to remove the coupler. 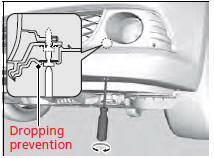 5.Rotate the old bulb to the left to remove. 6. 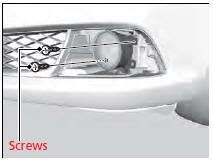 Insert a new bulb into the fog light assembly and turn it to the right.